Frequenzbereich 200Hz bis 4,5 MHZ. Zustand :Gebrauchtes Gerät mit stärkeren Gebrauchsspuren. Das Gerät ist grundsägtzlich funktionsfähig und wurde stichprobenartig bei verschiedenen Frequenzen und Pegeln getestet. Multiple tester ports (RJ45, RJ45 Loopback, RJ11 & BNC). Tester RJ45 master port (M), tester LOOPBACK RJ45 port (L), far-end recognizer RJ45 port (R). Main tester: approx. Tester Port With this set, only one person is enough to complete cable continuity check. Range of frequency:S110 47MHz ~ 870MHz. Resolution: 0.5dB. Signal input range: ≥ 85dBuV. Input Impedance: 75Ω (unbalanced, F-type connector). Input range: 1 ~ 100V (AC / DC). OUTPUT: 9V ~ 2000mA. Range of frequency:S110 47MHz ~ 870MHz. S110D 5MHz ~ 870MHz. It is widely applied in the routine maintenance of the CATV system. Resolution: 0.5dB. Signal input range: ≥ 85dBuV. Input Impedance: 75Ω (unbalanced, F-type connector). Range of frequency: S110 47MHz ~ 870MHz. Resolution: 0.5dB. Audio output: built-in speaker (single-frequency mode manual start). Input Impedance: 75ω (unbalanced, F-type connector). Input range: 1 ~ 100V (AC / DC). Data Log - The Birdog Ultra can Save up to 16 Custom files for upload to your PC. BIRDOG Accessories. Log Reader Instructions (pdf). Input Range. Wildblue Power - out of the box. All in one Zip Code look Up The new Zip Code feature enables you to quickly enter your installation site Zip Code to obtain your look angles and is pre-loaded as one complete table. Used condition. All functions have been tested and are working. Built in Nashville, Tennessee. The circuit board is dated 1984. TFT color screen multifunction display, easy operation, the picture more clearly. peak detection. U.S. digital standard channels USA STD-CATV. Input Impedance. Level Range. -25℃～ 45℃ super wide working temperature range, solves the problem of low temperature under the working conditions. 46/5~870MHz. Bit error rate(BER). Channel and single frequency mode. Symbol rate. Compact, light-weight, easy to carry;. Digital DVB. Digital average power. Channel scan. LED Lichter. - Arbeitstemperatur: 10 ℃ ~ 40 ℃. Die beste Arbeitstemperatur beträgt 10 ℃ -40 ℃. Videospiele Accessoires. - Leistung: 9V Batterie (nicht eingeschlossen). - Reaktionszeit: 0,5 s. Lesen Sie die Anweisung sorgfältig vor Gebrauch. 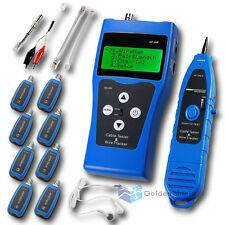 AE2300 Series Handheld OTDR is a high performance, multi-purposes handheld OTDR. The visual fault location (VFL) could assist OTDR locate the fault much quicker. AE2300 is the ideal OTDR solution for both installation and maintenance services. Cable map indication. Check wiring error in 5E, 6E, coaxial cable, such as open circuit,short circuit, jumper wire, reverse connection. LCD 53x25 mm, with backlight. Shielded indication. distance of cable map. Wavetek Microstealth Cable. Leakage Antenna. Leakage test finds potential points of ingress, as the source may not be in operation while the installer is at the house. Acterna LST-1700 Signal Transmitter. Wave detection: peak value. Bandwidth: Ranging between 10MHz, 25MHz, 50MHz, and full span. Number of Channels: 200 channels max. Accuracy: ±2dB(0℃~40℃). 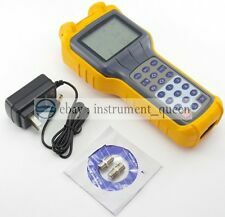 Channel Scan Accuracy: LEVEL (> 35dBuV) ±2dB (10°C to 30°C). Panel Cutout Dia. : 22mm. Pilot Light Type. Green LED 3 Digital. Panel Cutout Dia. : 22mm. Pilot Light Type. Yellow LED 3 Digital. S110D 5MHz ~ 870MHz. KCH20 SOFT CASE. Range of frequency: S110 47MHz ~ 870MHz. Resolution: 0.5dB. Signal input range: ≥ 85dBuV. Audio output: built-in speaker (single-frequency mode manual start). Input Impedance: 75Ω (unbalanced, F-type connector). 46/5~870MHz. Bit error rate(BER). Channel and single frequency mode. Symbol rate. Compact, light-weight, easy to carry;. Digital average power. Channel scan. 20dBuV ~ 120dBuV. Used device in working condition. Tested using a 1310 and a 1558nm Fabry Perot laser to be seen as WDM channels. • Whole range transducer models are available for almost all kinds of application, including coarse grain material gauging and high temperature applications (Max. temperature up to 300°C). • Adaptive probe function built in: Patent technology of automatic probe recognition: Automatically recognizing for probes allowing the gage to match with probes made from various probe manufacturers. Panel Cutout Dia. : 22mm. Pilot Light Type. White LED 3 Digital. Frequency scope:47~870MHz. Frequency scope:46/5~870MHz. Bit error rate(BER):RS 1E-3~1E-9. Symbol rate:1MS/S-7 MS/S. Channel and single frequency mode. Analog TV. Compact, light-weight, easy to carry;. The DS2460Q can learn a selection of up to twenty (20) different channel plans. When connected to an RF drop, the DS2460Q learns analog/digital channels and custom frequencies through the built-in automated channel plan learning tool - or downloads them via Deviser's Toolbox PC software. 46/5~870MHz. Bit error rate(BER). Channel and single frequency mode. Symbol rate. Compact, light-weight, easy to carry;. Digital average power. Channel scan. Technical Data. The display is easy to see in bright sunlight. Six Channel Mode. Scan Rate: < 1 second. Accuracy: 10kHz @ 25°C; ( 20 kHz over temp.). Tuning Resolution: 25 kHz. Range: -10 to 50°C (14 to 122°F). Number of Channels: 6. Panel Cutout Dia. : 22mm. Pilot Light Type. Blue LED 3 Digital. A test report is easy to be obtained via PC Toolbox Software. DVB-T Signal. Power Level Range 25 dBμV ~ 110dBμV. Power Level Accuarcy ±2.0 dB(C/N >20 dB). Level Resolution 0.1dB. Channel Power Range 30 ~ 100 dBμV. Spectrum Function. Spectrum function. 30 dBμV ~ 110 dBμV. C, Ku, Ka or L Band. Key Features. Level Range. RF Input Range. 153 mm × 93 mm × 42mm. 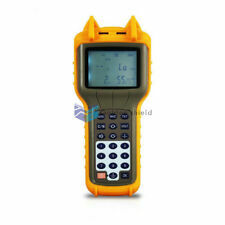 (● 5 to 870 MHz Standard Frequency Coverage ● Full Scan, Single Channel, and Spectrum Modes ● Data Logging ● Large, High-Resolution Display ● Rugged, Simple to Use, and Cost Effective). In Good Condition.